I wrote about Arthur Lismer (he of The Group of Seven) in Long Beach Wild and also here on the blog. One of the things I’ve been searching for though, is a photo of him at the beach. After a talk at the Alberni and District Historical Society in April of this year, I received a wonderful note from Meg who included a photocopy of this photograph. 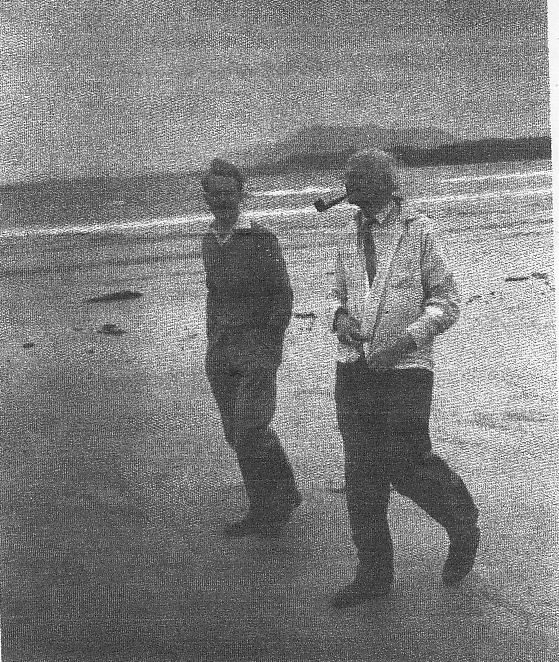 It is, indeed, Arthur Lismer on Long Beach, walking with Robert Aller (notice the image on the page I linked to is of Wickaninnish Bay, which is where this photo is taken), who had been a student of Lismer’s. Meg did not have the original of the photo, so I will begin a search for it (as well as others). If you know of one, please let me know!